Walk up tomorrow morning with me! I'm in Florida right now prepping for tomorrow's HSN Today 7am EST show. It's going to be a purse party featuring Elite Models Handbags and me yapping about spring 2009 trends. I hope you'll be able to tune in to the show and support me, and shop of course. There will be about eight bags in the hour, and if I had to pick favorites there are two that you absolutely can not miss. First up is the Elite Crinkled Wristlet for $19.90. I love mini clutches and wristlets as my bag-within-bag. When you have to run out for lunch or just crab a cup of coffee at Starbucks, it's so much easier to grab this wristlet with all your essentials and go. What about using it to easily switch out those essentials from your work bag to your weekend bag? It will fit your blackberry, wallet, lip gross, compact and keys. This $19.90 option is all about versatility ladies. You will love it as much as I do. Yes, I do own it in black! Keep you're eyes glued to the screen as I try to destroy this bag to prove our durable it is. Now, my number two must-buy, and it will be my bag-a-licious pick from the show tomorrow is the Elite Croco Embossed Tote. HELLO!! it looks amazing. Yes, it's not real leather, but bagistas for $49 it beyond affordable luxury. Plus, the colors. Which one to buy? I'm torn between the yellow (a perfect no sunshine, neutral yellow) and the black. Then again, that orange is also so killer. I don't own this bag yet, but I'm hoping I can buy one tomorrow after I get off air. OK. So, watch because I love when all you bagistas tune in. Thank you so much for reading this blog, for visiting http://www.bagtrends.com/ and making the last 4 years very bag-a-licious for me. 2009 is going to be a big one in many ways and I look forward to sharing every detail, every seem, every bag, every moment with you. PS Share your thoughts about these bags and others on the show. I'm going to also see if I can'ts score a giveaway of the croco tote!! Last Friday, I hosted an exciting International Women's Day Soiree for MCM Handbags at their uber-sleek Plaza Boutiques store (in the renounced Plaza Hotel location, across the street from Central Park.) Fancy me! I was thrilled to speak on behalf of such a prestigious brand, one that I remember quite vividly from childhood. That's actually one of the reasons they invited me to host the event, which was primarily catered to the Russian shopper who would have also remembered this iconic brand from the late 80s and early 90s. Being that I'm a product of this community and I'm a handbag expert it was a perfect union. For 6 hours I chatted up MCM's history, their fabulous spring 09 line (the watermelon bags had me watering at the mouth for sure!) which includes the permanent return of the Vintage Cognac Visetos Collection, and overall trends for spring and beyond. Below are some shots from the event, including some very happy shoppers who enjoyed the evening's 20% off special. The evening capped off when a Russian news crew from RTVi came to film the event and do an interview with me - in Russian! Grand was so proud :). I hope you'll join me on April 13th as BagTrends.com hosts our first BagTrends GREEN Arm Candy Party, a spin off the signature parties you all know and love. Everything at this event will be green and very bag-a-licious from the designers, to our always fabulous spa room, to the drinks, even our gift bags!! Best of all, this time it's FREE to attend. Space is limited, so you do need to RSVP(at)BagTrends.com to ensure your spot! Why go green, you ask? Well, I recently read Gorgeously Green and it all just clicked. I've always recycled my basics, sometimes even going beyond and ripping apart old designer lookbooks to remove the non-recyclable parts. I don't waste water and turn off lights/electronics when not in use. But, that was it. What about my makeup and the chemicals I was putting on my face and then when I washed it off where did those chemicals go and what did they do? And, what about reusable materials for home and fashion design? I loved that Gorgeously Green didn't overwhelm or preach; it slowly educated and offered up options - many of which I still plan to research further!! And that brings me back to the BagTrends GREEN Arm Candy Party. Consumption is a way of life and the only way to really push change is to show consumers that green can be gorgeous, and well, bag-a-licious. If we start to spend our green dollars on green merchandise it will a) show our political leaders what we value b) create competition in the green market and c) lower the costs of many eco products. So, the past few months I've been on the hunt for amazing green/eco handbag lines, jewelry and in the bag essentials. It's been an exciting challenge and the journey of educating myself has been an added reward. I hope you'll come to the BagTrends GREEN Arm Candy Party to shop amazing green lines, sip our eco drink, indulge in our green spa, and leave with a fabulous gift bag (which ps is compostable, fare trade, reusable and cute) full of good-for-you and good-for-mother-nature items. 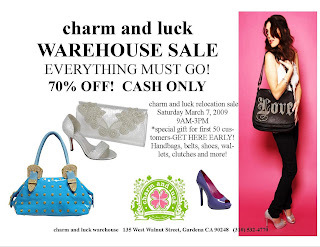 My friends Jenny and Christine Syquia - the sister duo behind Charm and Luck handbags - are moving! What does that mean for you? Great deals. The gals need to clear out massive amounts of handbags from their main line Charm&Luck as well as their higher-end Fillippa Sweet collection and more moderately priced Calla line. Sorry my east coast and mid-west bagistas. This one is for the LA Divas.